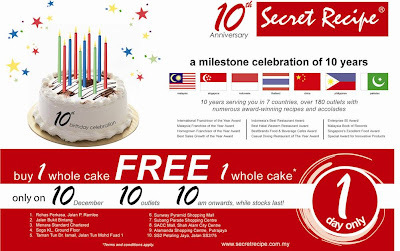 It’s Secret Recipe’s 10th Anniversary ! on Monday, 10 DEC, at 10 OUTLETS, 10 AM onwards* for 1 DAY ONLY!! * 20 types of cake selections for you! Whilst Stocks Last! This promo will be applicable at the following 10 outlets in Klang Valley, MALAYSIA only!